If you’re in the market for a mid-range, cheap-yet-powerful smartphone, ASUS thinks they have the phone for you. 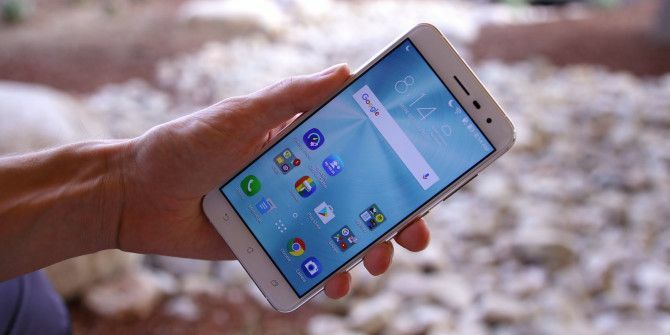 The Asus ZenFone 3 rivals similar phones like the OnePlus and the ZTE Axon 7 that offer high-end specs, but for several hundred dollars less than other flagship devices. You might be familiar with last year’s ZenFone 2 ASUS ZenFone 2 Review and Giveaway ASUS ZenFone 2 Review and Giveaway As more people are fed up with smartphones that cost well over $600, some manufacturers are taking notice. ASUS brings us the ZenFone 2, a $299 phone with internal specs that easily trump its competitors. Read More , but this is a whole different beast. The ZenFone 2 was bulky, plastic, and had terrible battery life. The ZenFone 3 is thin, made of glass and metal, and has great battery life. It doesn’t even seem like a successor to the 2 — more an entirely different phone. Let’s find out exactly what makes this phone so great. This phone feels so premium. There’s no other way to put it. For under $400, this kind of build quality is unheard of. With a glass back panel and curved aluminum sides, the ZenFone 3 feels sleek and comfortable in your hand — if a bit slippery. Asus’s signature concentric circles radiate out from around the camera fingerprint sensor on the back in an incredibly elegant fashion. The curved glass on the front of the device leaves the edges feeling polished and high-end. Everything about this smartphone’s exterior screams modern and top of the line. The textured power button and volume rocker can be found on the right side of the device, the headphone jack is up top, the microSD card and SIM card slot is on the left, and the USB Type-C port and speaker are on the bottom. For navigation, the ZenFone 3 relies on capacitive keys rather than a physical home button like the Galaxy S7 or virtual keys like the HTC 10. There’s no back light for the buttons, which I actually prefer, but some folks have complained that they’re impossible to see in the dark (but, come on, you know where those three buttons are). On the rear of the phone, the 16 MP camera juts out a little. Just beneath it, there’s a fingerprint scanner that’s blazingly fast. The only reservation I have about it is the placement — it’s great if you’re holding the phone, but if it’s resting on a table, you’ll be typing out your PIN to open the device. Still, I’m just in shock over how nice this phone feels while still being so cheap. I’m a big fan of budget phones 5 Ways Cheap Android Smartphones Beat the Flagships 5 Ways Cheap Android Smartphones Beat the Flagships Who says you need the latest and greatest (and most expensive) smartphone out there? The cheaper alternatives are actually really good. Let us show you. Read More , but they never feel this premium. The screen is a 1080p Super IPS+ display, which is crystal clear and brighter than most other smartphones I’ve tested, making it easier to see in direct sunlight. That 16 MP shooter on the rear is really quite good. While the camera is usually the first thing to go when cutting corners for a cheap device, Asus really went all out here. Images are crisp and clear, and the Camera app has a plethora of features. There’s even Optical Image Stabilization, which keeps your videos super smooth and reduces blur from shaky hands. But what impressed me the most is how quickly it can take photos in succession — something a lot of phones struggle with. I found the 8 MP front-facing camera to be better than most other smartphones that only have 5 MP front-facing cameras. Don’t worry, your selfies will be lovely. The single speaker along the bottom of the ZenFone 3 is one of the few weak points of this phone. It’s not that loud, and the placement on the bottom isn’t as nice as a front-facing speaker would be. Asus has included an “Outdoor Mode” feature that you can toggle on and off when adjusting the volume, but it just seems to sacrifice sound quality for a bit more volume. Overall, the audio you’ll get out of this is definitely acceptable, but it’s not the best. Every phone has to have its Achilles’ heel — say hello to the ZenFone 3’s. While the specs and physical design might be great, the software is really what holds it back for me. Sure, it’s running Android 6.0 Marshmallow as most flagships are (aside from Google’s Pixel, which launched with 7.1 Nougat Google Unveils New Pixel Phones, Chromecast Ultra, & More... Google Unveils New Pixel Phones, Chromecast Ultra, & More... Google has unveiled a host of new hardware, including new Pixel phones, the Chromecast Ultra, the Daydream View, Google Home, and Google Wifi. Read More ), but it has a heavily customized overlay called ZenUI Android Skins Explained: How Do Hardware Makers Change Stock Android? Android Skins Explained: How Do Hardware Makers Change Stock Android? Hardware makers like to take Android and morph it into something that is entirely their own, but is this a good or a bad thing? Take a look and compare these different Android skins. Read More . ZenUI is a big, bright, round, colorful take on the Android experience. It reminds me somewhat of how Samsung’s TouchWiz interface used to look (Samsung has dialed it down in recent years) because it’s kind of busy, cluttered, and immature. But, that’s personal preference. Maybe you like how it looks! There are also a bunch of new “features” that you won’t find in stock Android, like shortcuts on the lockscreen, extra shortcuts in the Quick Settings, ZenMotion gestures, themes, Easy mode, and Kids mode. ZenTalk, ZenCircle, and Webstorage are Asus’s own messaging, social, and cloud service apps that I doubt anyone actually uses. The list goes on and on with pointless software, especially when apps serve the same purpose as the built-in Google apps — like a Gallery app even though Google Photos is installed too. It’s not all bad news, though. Mobile Manager has some useful features, like controlling which apps can automatically start when you turn your phone on. And when you tap the Recents key, you get three buttons along the bottom for quick access to certain tools like pinning apps, clearing your RAM, or viewing your list of apps. And even if you do like all of the software customizations, they might mean that the ZenFone 3 receives painfully slow updates (because it takes longer to update the code with all of Asus’s customizations). I’d be shocked if Asus delivered 7.0 Nougat to this phone within the next 6 months, and I’d be even more shocked if it was upgraded past that. Asus hasn’t even officially confirmed that it will see a Nougat update. Powered by the Snapdragon 625, the ZenFone 3 might not have the best processor on the market, but you won’t really notice in day-to-day usage. I played games and multi-tasked just fine, helped along by the hefty 4 GB of RAM. It never felt like it wasn’t performing well, and the 64 GB of internal storage was more than enough (plus it’s expandable with a microSD 5 Mistakes to Avoid When Buying a MicroSD Card 5 Mistakes to Avoid When Buying a MicroSD Card Buying MicroSD cards may seem simple, but here are a few critical mistakes to avoid if you don't want to regret your purchase. Read More card up to another 128 GB). Given the weak battery life of its predecessor, I didn’t have high hopes for the ZenFone 3, but it actually turned out to last quite a while. The 3,000mAh battery lasted through every day without a problem — unless I was running it down with intensive apps. However, the best part might be that it uses USB Type-C What Is USB Type-C? What Is USB Type-C? Ah, the USB plug. It is as ubiquitous now as it is notorious for never being able to be plugged in right the first time. Read More , the new standard that is reversible and allows for faster charger and faster data transfers. Since the ZenFone 3 also support Quick Charge 3.0, it can be fully juiced up in about an hour and a half. To me, I feel like the Asus ZenFone 3 is an extremely well-designed phone at a low price that’s hampered largely by its intrusive and bloated operating system. If you’re a stock Android-lover, you’ll hate it. But if you’re new to the Android platform or you just like the interface, it might not be such a bad choice. And for less than $400 (depending on which color you get), the build quality is really unmatched. Damn, this is an awesome phone!....so, who won it?? over the past models, Zenfone has earned its credibility when it comes to phone photography because of its unique camera features. But to be honest on this one, Id rather go or LG G5. The wide angle feature of the phone definitely attracts users who's very fond of taking selfies and taking shots closely similar to DSLR's quality images. I like the look of this phone. Seems like it might be worth a try. I have the Zenfone 2 and, besides the so-called bloatware it is a decent phone. Zen UI lets you disable most of the stuff you don't need, but some of them are useful: What's Next for reminders, Splendid for Bluelight filter, Power Saver and Mobile manager for blocking annoying apps or acting like a firewall, Audio wizard is decent, even mirror is sometimes useful. I agree that email, browser and some other apps are overkill, but 50% of them are useful and saved me the time of finding alternatives. To each his own, I guess. If you say that the battery is better than the one on ZF2, consider me for the giveaway. All right here I try again with the hopes of beating the odds and winning a phone of repute from a website that stretches of the well worn path to deliver for me a comprehensive review. The greatest I say , No one listens no one hears but I do and I hope that one despite all odds I will win that almost mystical give away of a phone. And as I grow old I will tell my children and grandchildren of the time I won a phone an epic to behold. I Love Asus Smartphone. Its software is always updated. Love Asus products. I've been using them since they were THE motherboard manufacturer in the late 90's early 2000's. Would love to try one of their phones. I'll be forever grateful if MUO will pick me! ? Awesome phone to maximum use.like to win it. I wish I could win. My brother has this kind of phone, but that it's the black one. This is pretty gorgeous. It's also really cool. ????? I would love to own one of these, it's unique in its own style and it would be interesting to compare it to my friends who have some of the latest mobile phones. My son bought one and he loves it. The camera takes amazing pics. nice review! Im looking for a new phone this would be great,thanks! I really hope I could get this new Asus Zenfone 3. I have used both its predecessors (Asus Zenfone 5 and Asus Zenfone 2 Deluxe) and I'm loving it. I don't mind the ZenUI because in my opinion, that makes the Asus line-up stands out from the rest of the smartphones (though I do hate bloatwares). I hope you will consider my entries. By the way, good review.